Tourists and nearby residents walked for peace at the Armenian Heritage Park Sunday. A block from Faneuil Hall Marketplace, where shoppers scuttled from store to store in search of the perfect holiday gift, more than 100 people walked silently Sunday evening along an intricate pathway of stone at Armenian Heritage Park. Luminaria placed throughout the labyrinth lit the night, as people walked to the center and out, searching for inner peace during the park’s second annual Candlelit Labyrinth Peace Walk. The message of peace rang out amid a violent end to the year — with attacks in Paris, California, and Colorado. Attendees also said the gathering was an occasion to look inward and find needed calm during the holiday season. “The event allows people a place to quiet down and reflect, especially during this busy time of year,” said Beth Mace, president of the Labyrinth Guild of New England, which sponsors the event. A labyrinth is a pattern of concentric pathways leading to a center point. The one at the Armenian Heritage Park at the Rose Kennedy Greenway is meant to celebrate the journey of life, according to the park’s website. 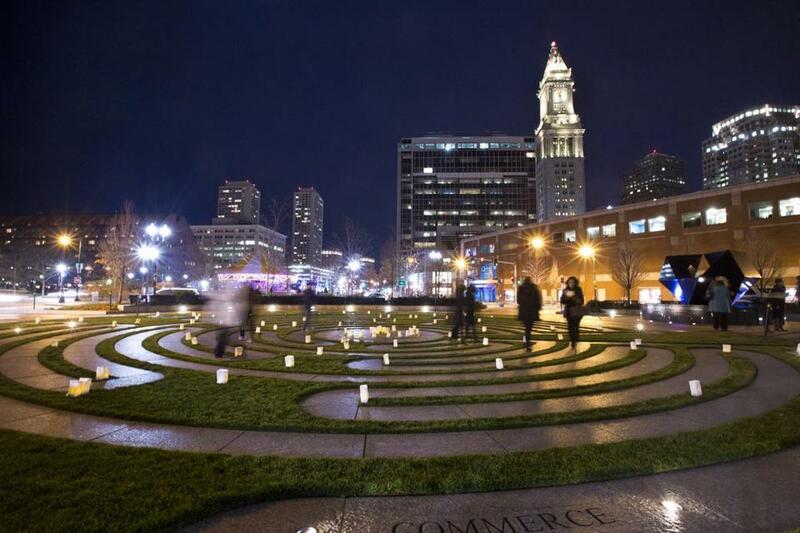 The peace walk began last year when Christine Osterwalder, a Hawaii resident who was coming to Boston for the holidays, e-mailed Mace’s organization to express interest in a candlelit labyrinth walk. Osterwalder fell in love with the meditative benefits of a labyrinth while she was in graduate school. She returned for this year’s walk. It is a simple way to celebrate the holidays, she added. Participants at the event were also invited to write wishes on ribbons and tie them to a tree, part of an old Armenian tradition, said Barbara Tellalian, a member of the Friends of the Armenian Heritage Park. Three-year-old Maeve Donohue and her mother, Gretchen, wrote “love each other” and “peace” on their red and pink ribbons. Moulding has walked labyrinths in many places, but she said the one in Boston is unique because it provides peace in a busy city. “In the middle of all this noise, you can be quiet and contemplative,” she said. For Tsoleen Sarian of Wayland, walking the labyrinth provided a much-needed break.